Added on April 19, 2017 by Lauren Chai. Korean Cultural Center's 1st exhibit featuring 16 works of Austin artist Lauren Hana Chai. As a self-exploration shown visually through Chai's oil paintings, these works center around her search for her missing mother, and the plight of the North Koreans. 20% of all profits will be going to the non-profit organization Liberty in North Korea. One night only; May 25, 2017, 6-9PM at Korean Cultural Center 1809 Hollister Street. Houston, TX. 77080. Free to attend, food and drinks provided. Artist talk and silent auction for a painting of North Korean defector Park Yeon Mi. Prints of "Park Yeon Mi" will be sold online with 20% going towards LiNK as well. For those who can't make it to the show can purchase prints of "Park Yeon Mi" online here. Lauren’s search for self is an ongoing process, through which she heals herself and discovers her identity as a young Korean-American female. In The Last Known Locations series Lauren keeps track of the 6 cities which are her mom’s last known locations. In the process, she finds a way to relieve her loss and to connect with Mira, her mom. 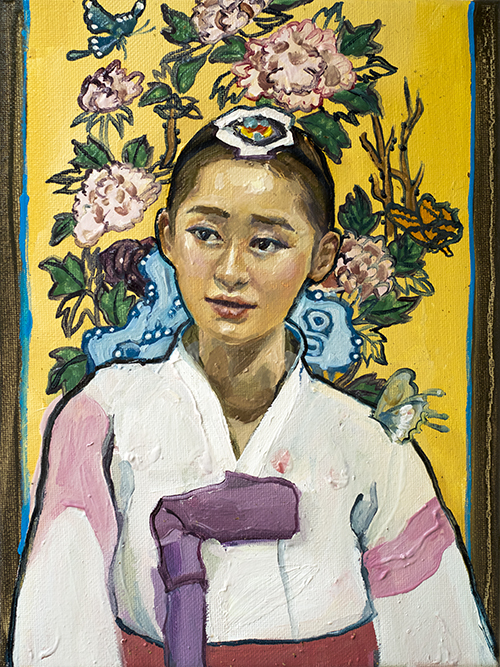 In her North Korea themed paintings, Lauren delves deep into her grandmother’s personal experience and the uniquely Korean emotional pent-up “Han.” In the context of rising tensions between North Korea and the US, Lauren hopes to build awareness of, not only North Korea's situation, but its connection with the rest of the world, and to raise funds for aid to the safe rescue and refuge of North Koreans. 어스틴 거주 채하나양은 KCC에서 16 점의 작품을 선보입니다. 유화라는 시각적 매체를 통해 작가는 어릴 때 행방불명된 어머니에 대한 추억과 북한 동포들의 현실을 담아내는데, 이러한 일련의 과정 속에서 또한 자신의 상처를 치유하고 동시에 젊은 한국계 미국인 여성으로서 정체성을 발견해 나가게 됩니다. 어머니가 마지막으로 지냈던 것으로 추정되는 여섯 개의 도시를 주제로 한 “마지막 알려진 장소” 시리즈나, 북한에 이산 가족을 둔 작가의 외할머니의 경험담에서 영감을 얻은 북한을 주제로 한 작품 등이 전시됩니다. 관람은 무료로, 작가 소개 및 작가와의 대화와 함께 전시 수익금의 일부는 탈북 동포들의 구조와 재정착을 돕는 비영리 단체에 기금으로 전달될 예정입니다.